The SonoSite iLook portable ultrasound with an all-digital architecture, and many operators prefer this handheld ultrasound machine for its ability to acquire and display in real-time, 2D, color power Doppler, directional color power Doppler, and Tissue Harmonic Imaging. With the combination of high-end image quality and portability, the SonoSite iLook ultrasound is ideal for point-of-care situations. It is also popular for its vascular access, abdominal imaging, needle guidance, PICC lines, and general cardiac imaging. When imaging, operators can take advantage of this ultrasound’s cine review, distance measurement, volume calculation, image storage, and image review. 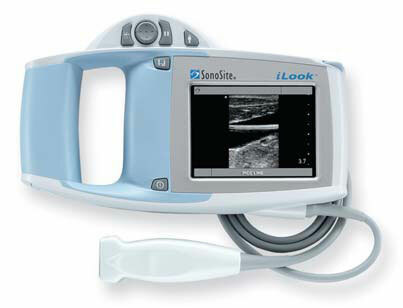 The SonoSite iLook is capable of using two probes, a microconvex and a 25mm linear probe. As one of the more popular ultrasounds, the SonoSite iLook offers easy, convenient, and high-quality quick-look diagnostics, and this system is suitable for emergency departments, radiology, intensive care, and surgical recovery. There’s not much to this ultrasound machine, which is what’s so great about it. It’s very easy-to-use and designed for clinicians to get quick access to veins and arteries. The image quality is very good for PICC Lines and other vascular access needs, and with the microconvex you can view abdominal, simple cardiac, and other general radiology for a simple and quick diagnostics. Simply put, you turn it on, get your image, and move on. No bells and whistles or other extraneous controls. It’s perfect for this market because its cost is low and usability is great.